Most homeowners we’ve encountered hate it when there’s a plumbing problem of any sort, but especially when there’s a problem with the pipes. The problem feels so big, and most people don’t have any idea what it will take to fix the problem. They feel overwhelmed, frustrated, and even angry (because these things never happen at an opportune time!). This is where we come in. 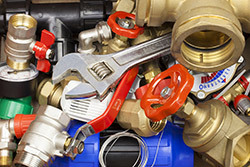 We want to take the stress and strain off of you by sending out plumbers you can trust. We know that you need your Greece, NY home to function well, and we’ll work hard until we’ve achieved that for you. Plumbing problems may still be frustrating, but when G. T. Campbell is on your side, you can trust that solutions aren’t very far away. Sometimes, it’s obvious that you need to call a plumber in Greece NY for your pipes. They may be spraying water everywhere, causing a mess and damage you don’t need in your life right now. If this happens to you, call us. We’re always here for you, and we’ll get someone out to get the repair started right away. Other times, it’s not clear if you need a plumber. Here are some things to look for if you’re on the fence. Your pipes make a banging noise. This usually happens in older homes, and it indicates that something isn’t right in your plumbing system. We will come out, determine exactly what is going on, and give you a solution that will keep your water flowing without all of the obnoxious noise. You smell or see mold and mildew growth. If you have mold and mildew growing in unexpected places, or you smell something vaguely mildewy but you don’t know where it’s coming from, you may have a slow leak in a pipe somewhere. Over time, these leaks create a moist environment that’s perfect for mold and mildew growth. Your water isn’t flowing like it used to. Do you feel like you used to have better water pressure and there’s no explanation for the slowdown? You could have a problem with your pipes that’s causing your slow flow. We’ll come find the problem and get that pipe repaired so your water runs normally again. Your sinks won’t drain. If you’re having problems with your drains, chances are you have a clogged pipe somewhere in your system. No matter how deep into your plumbing system we have to go, we’ll find the clog and remove it, so you can use your sinks, tubs, and toilets again without worrying about anything. Even if you don’t have one of these problems, you may need to call a plumber to look at the pipes in your Greece, NY home. If you feel like something isn’t right or you’re not sure and you just want to have someone take a look for your peace of mind, give us a call. We’re here to make sure you feel confident about the pipes in your house.